Marie D. Jones interviewed author M.J. Rose about her novel The Reincarnationist , past-life regression, and the lengths to which she went to research this historical thriller. Interviewer Marie D. Jones: M.J., this is not just one story, but two intertwined stories that move back and forth between past and present. Did you find it a challenge to keep the two plotlines straight? M.J. Rose: Actually there are three, but the book very much unfolded for me moving from the past to the present and then back again. I didn’t find it a challenge to write, but I did when I thought about it. What began your interest in reincarnation and past-life regression? Have you ever experienced glimpses of a past life of your own? He became convinced I was a reincarnation of someone in his past. And over time, after more incidents, my mother – a very sane and logical woman - also came to believe it. So reincarnation was an idea I grew up with. That my mom and I talked about and researched together. Until a few years ago on the exact anniversary of my mom’s death, my niece said some very provocative things to me about my mother – things she really couldn’t have known – and the pestering idea to write this novel became an obsession. There’s only one past life of mine that I’ve been able to glimpse though I have been to a Reincarnationist who was able to tell me about some of my past lives. You’ve written a historical thriller that required plenty of research. Do you enjoy the research aspect of writing? When do you know you’ve done enough research and are ready to write? I did enjoy the research but was surprised by much I got caught up in it. I’ve literally been researching this book for years in various ways and studying the subject for most of my adult life. To date I’ve read at least 60 books on the subject, have interviewed dozens of people and spent six months visiting a past life regressionist. Specifically I have 1200 pages of notes for The Reincarnationist and 1534 page of notes for the next book in the series. There’s even a bibliography in the novel. As for how did I know when I’d done enough? I emailed a friend, a fellow writer who writes historical fiction, and asked him how I could find out what exactly would the sandals a Roman woman in 391 AD look like. He wrote back: M.J. No one alive now knows. If you are worried about what the sandals look like, its time to stop researching and start writing the bloody book. Describe a typical writing day. Do you set a page limit, write at certain times, have any interesting writing superstitions? Three months before I start a new novel, I start my main character's scrapbook. The very process of collecting his or her past - preferred poems, swatches of favorite colors, letters, postcards, memorabilia allows me time to find him or her. I collect everything - the ticket stubs for a performance of the Metropolitan Opera that she went to, a postcard from his mother's first trip to Europe, a piece of the red and white string on the pastry box from her grandmother's apartment: it's all in the scrapbook. Only when I've found all the knickknacks of that imagined life and I've done a fair amount of procrastinating do I sit down to write. By then I’ve unconsciously worked out a lot of the plot of the themes of the book. Then its about four or five hours a day five days a week. Usually from 1 in the afternoon to 5 or 6. I write two to four drafts of every book with that schedule. And then the last draft is always an intense mess when I work about 15 hours a day, 7 days a week. For two weeks. Your book explores the Roman church’s denial and subjugation of the concept of reincarnation. Why do you think this subject was so taboo to the motives and beliefs of the early Christian church? Reincarnation has been part of every ancient religion and most modern religions. Obviously Hinduism and Buddhism. But Muslim Sufis believe in it still. And it is major part of the Kabbala – which is the mystical part of Judaism. It was part of Christianity until approximately 400 years after the death of Christ when the Emperor of Rome had it written out of the church doctrines because it took too much power away from the church and gave it directly to man. Interestingly, according to my research, the largest growing segment of Americans who believe in reincarnation is Christians – with over 23% now believing. There are also many theologians who say the Gnostic gospels suggest that Jesus was not talking about resurrection at all but rather talking about being reincarnated and that the men who wrote the new testament hundreds of years after Jesus died changed those references to shore up the resurrection concept. You are one of those rare, successful authors who can move between fiction and nonfiction. What turns you on about each? Are there any other types of writing you’d like to attempt? Screenwriting? Plays? I started out writing screenplays and love them. I’ve written about a dozen – two based on my own novels – and had about six of them optioned. For a few years I did a lot of journalism but haven’t been doing much of that since I started a marketing company for writers, AuthorBuzz.com, and once a year (this Jan 08- Feb 08) teach an online marketing class. You wrote two books on marketing. Can you discuss a little bit about how marketing plays such a huge role nowadays for authors? There was a time when all authors had to do was write…that has changed, has it not?t? Sure has. 85% of all books get less than $2000 in marketing dollars from the publisher. At the same time there are 1000 novels published a month, 100,000 books a year. And reviews have shrunk by over 50% and the press is not interested in authors the way they are in every other kind of entertainer/celebrity. In a word, we’re screwed. No one will buy your book if it doesn’t exist. And no one will know it exists if there isn’t a certain amount of marketing done for it. The average person buys less than 4 books a year, yet every time he or she walks into a bookstore is overwhelmed by thousands of book he’s/she’s never heard of. Its why the name brand authors keep selling - everyone has at least heard of them. I left a career in advertising to be a novelist. I never thought I’d have to go back into marketing to stay alive as a novelist. I wish I could just write, but I want to keep writing. I care about continuing my career. When I first got into the business in 1999 and started writing and speaking about how authors needed to become marketing partners with their publishers, most of the industry thought I was crazy. Now, eight years later, it’s the norm. May we get a taste of what you are working on next? Novel? Nonfiction? Something else entirely? The next book in the series, The Memorist . I’m doing this series a little differently. There won’t be continuing characters but rather a continuing group of objects. The first book is about the discovery of and adventure around an ancient memory tool that helps people access their past lives. I’ve suggested in this book that there were 12 such memory tools created in ancient India over 5000 years ago. In each books in the series, a different one of those memory tools will surface and the story will flow from there. M.J. Rose International bestselling author M.J. Rose is the author of eight previous novels, including Lip Service and three titles in the Butterfield Institute series: The Halo Effect, The Delilah Complex and The Venus Fix. She's also the co-author of two nonfiction books on marketing. Rose is on the board of directors of the International Thriller Writers and lives in Connecticut. Marie D. Jones is a nonfiction author and contributing reviewer to curledup.com. 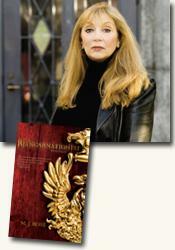 Her interview with M.J. Rose was written in conjunction with her review of The Reincarnationist . © Marie D. Jones/2007.